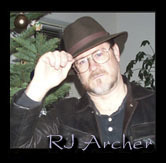 R.J. Archer is a mystery/adventure author, a freelance writer and a retired computer consultant who called the Pacific Northwest home for more than 30 years. The author and his wife, Marty, currently reside in Baja California Sur, Mexico. His non-fiction works include » TheMegaBlog.com, an online chronicle of underwater archaeology activities in the Caribbean, as well as numerous articles on PC- and scuba-related topics in both print and e-magazines. Find all of his fiction titles in print and in eBook for Kindle at » rjarcherbooks.com. Mr. Archer holds a Bachelor of Science degree with dual majors in Physics and Mathematics and he is a veteran of the U.S. Air Force. His interests include computing, alternative history, underwater archaeology and scuba diving.